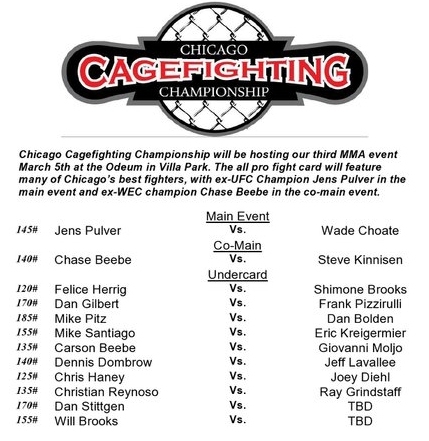 Chicago Cagefighting Championship just released the card for their March 5th show, and it looks excellent. Besides Jens Pulver and Chase Beebe, fans get to see the return of Dan Gilbert. Gilbert has fought only sporadically since 2004, but he is a veteran of Shooto, XFO, Ironheart Crown and Brawl at Bourbon Street. He has fought big names like Hayato Sakurai and Frank Trigg. Now he’ll make his first appearance in the cage since 2009. Check out our interview with Dan Gilbert from November of 2009, where he tells us how he and his brother, UFC vet Joey started Gilbert Grappling. Also on the card are Team Curran’s Joey Diehl, Felice Herrig and Eric Kriegermeier, MTC’s Mike Pitz and Dennis Dombrow, Hackney’s Jeff Lavallee and Gilbert Grappling’s Carson Beebe.